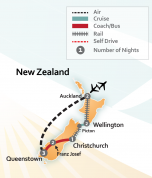 When it comes to planning the perfect New Zealand vacation, About New Zealand makes it easy. With all hotels, flights and transfers pre-arranged for you, all you need is to sit back and enjoy the vacation of a lifetime. 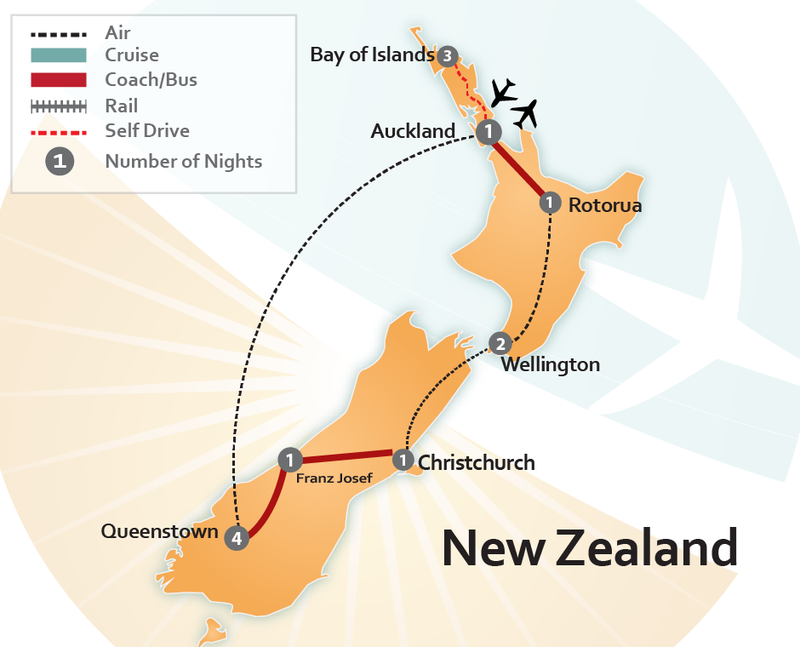 Our packages take you to the highlights of New Zealand’s natural wonders and world-class cities. Nature lovers are drawn to its majestic mountains, enchanting national parks and rolling green landscapes. For a little rest and relaxation, luxury spas and some of the world’s finest wine trails will transport you to paradise. Our packages give you the flexibility to experience your vacation at your own pace. If you prefer to have a native Kiwi (New Zealander) guide your trip, our all inclusive New Zealand vacation packages offer the highlights of things to do in New Zealand led by a professional tour guide. 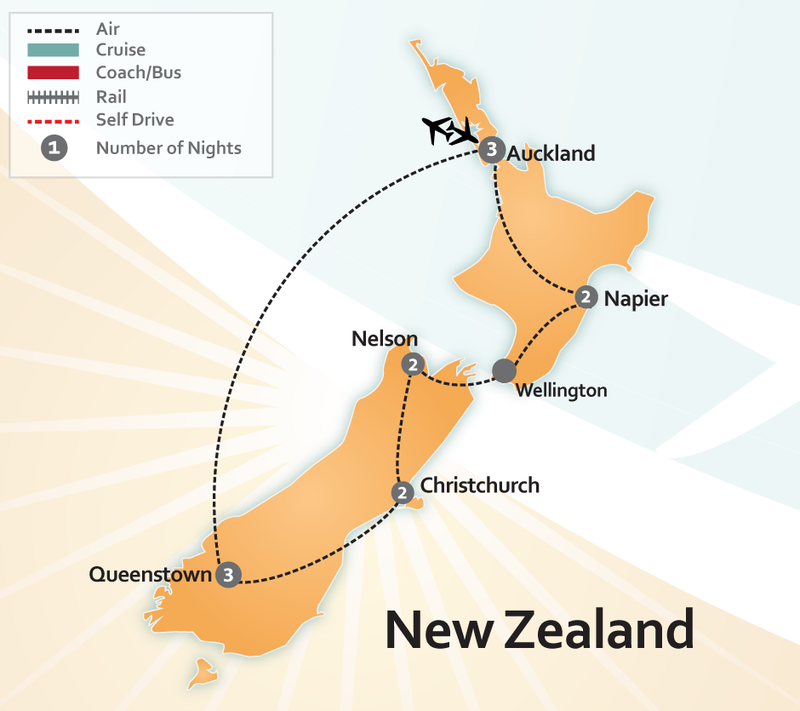 Score a deal with one of our New Zealand vacation deals if you’re traveling on a budget. Or want an experience entirely your own? 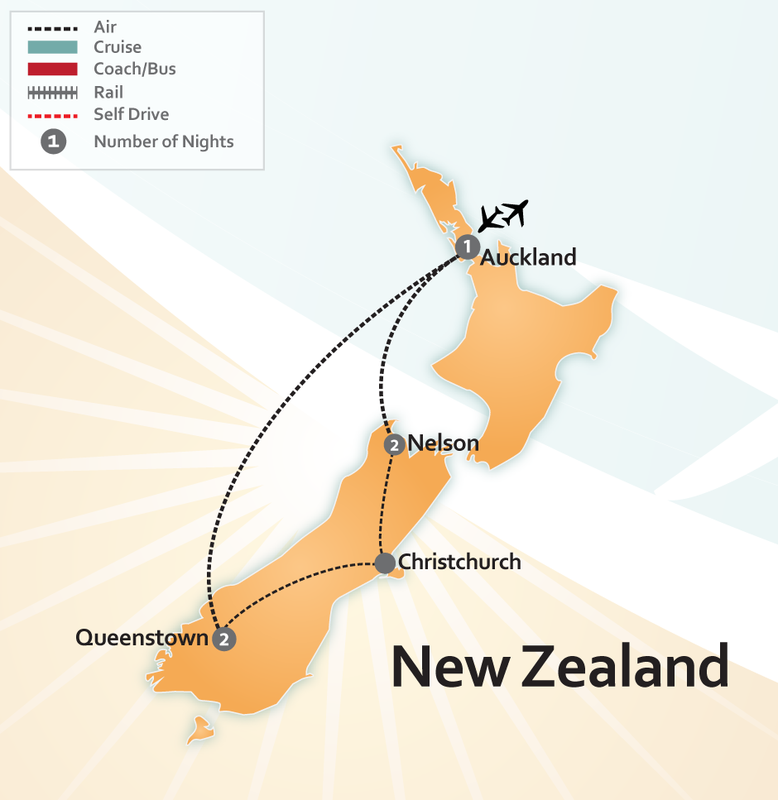 We can also create your very own custom New Zealand vacation – just let us know what you’d like to see and do, and our New Zealand vacation experts will design a package tailored just for you. 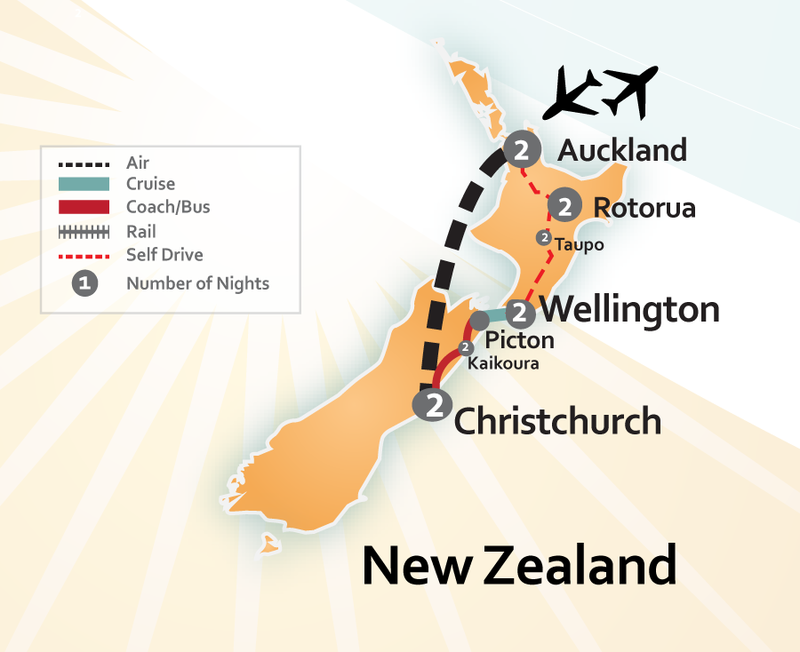 At About New Zealand, we’re passionate about creating your dream trip – take a look at our reviews for what our clients have to say about their experience! Separated into two islands, the volcanic North Island is like a totally different world compared to the South Island. 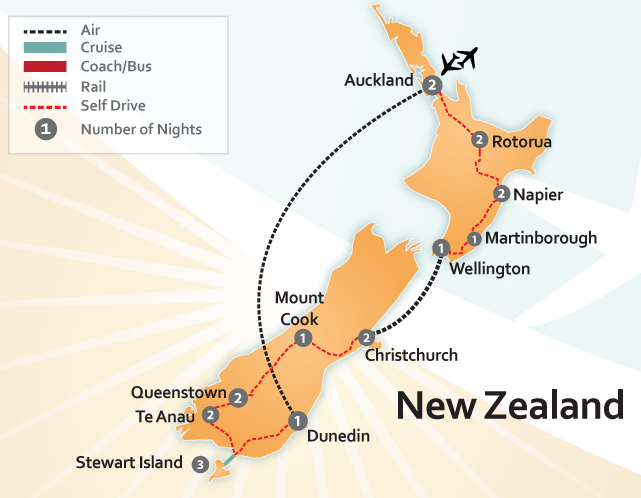 New Zealand is roughly the same size as Colorado with a population of just over 4.5 million, making an extensive vacation throughout New Zealand quite manageable. With its geothermal regions and rich Maori culture in the north and lush alpine forests and dramatic landscapes in the south, your trip to New Zealand isn’t complete without experiencing both islands. At the top of the North Island you’ll find the Bay of Islands, a paradise of pristine beaches, Maori cultural sites and stunning natural beauty. This popular holiday destination offers spectacular fishing, romantic seaside towns and relaxed sailing. Further down is Auckland. This multi-cultural hub combines urban city excitement with beautiful beaches, hiking trails and indigenous Maori culture. Known as the “City of Sails,” Auckland’s countless yacht marinas and sailboats precedes the locals’ passion for aquatic adventures. Explore buzzing markets and top-end designer shops or take in spectacular panoramic views of the city from the top of surrounding volcanic cones, covered in lush green parkland. We like to recommend a minimum of three days in Auckland to explore all this exciting city has to offer on your vacation to New Zealand. Lord of the Rings fans must make a stop in Hobbiton, where Middle Earth comes to life. Explore the verdant green pasture land and charming Hobbit holes of the Shire. Feast like a Hobbit and grab a drink at the Green Dragon Inn before you continue your travels. Journey through the magical Waitomo Glow Worm Caves and see the blue glow of these native insects illuminate the dark caverns. 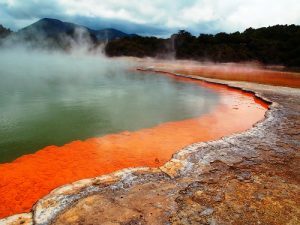 To experience New Zealand’s Maori culture, make a stop in Rotorua. Indulge in a hangi feast – a meal traditionally cooked from the steam emanating from the earth below – and feel the warmth of genuine Maori hospitality at Te Puia. Discover Rotorua’s mud pools and geysers, bubbling with incredible colors and invigorating minerals. Soothe your muscles in Rotorua’s luxury spas and healing waters. Or see the native Kiwi bird at the Rainbow Springs Nature Park. For adventure seekers, Rotorua offers incredible mountain biking trails, waterfall rafting, bungy jumping, luging, ziplining and other unique activities not to be missed on a New Zealand vacation. Indulge in the idyllic Hawke’s Bay region, where a growing food and wine scene set in magnificent landscapes awaits. Balmy days and stunning bays highlight this region, where a glass of wine or two will only make it better. As New Zealand’s oldest wine region, full-bodied reds and rich Chardonnays get no better than here. With over 70 wineries, you might easily spend your whole trip sampling premium wines. Visit Wellington, New Zealand’s capital, and immerse yourself in the vibrant arts scene of “the coolest little capital in the world.” Film lovers must make a stop at Weta Workshop, where Academy Award winning props and designs are created, used in films such as the Lord of the Rings. In Wellington you’ll find a strong craft beer culture and mouth-watering cuisine. Stroll through cultural antiquities and treasures in Te Papa, New Zealand’s national museum. End your day with a ride on the famous Wellington cable car to a hilltop for the most amazing views over the city. 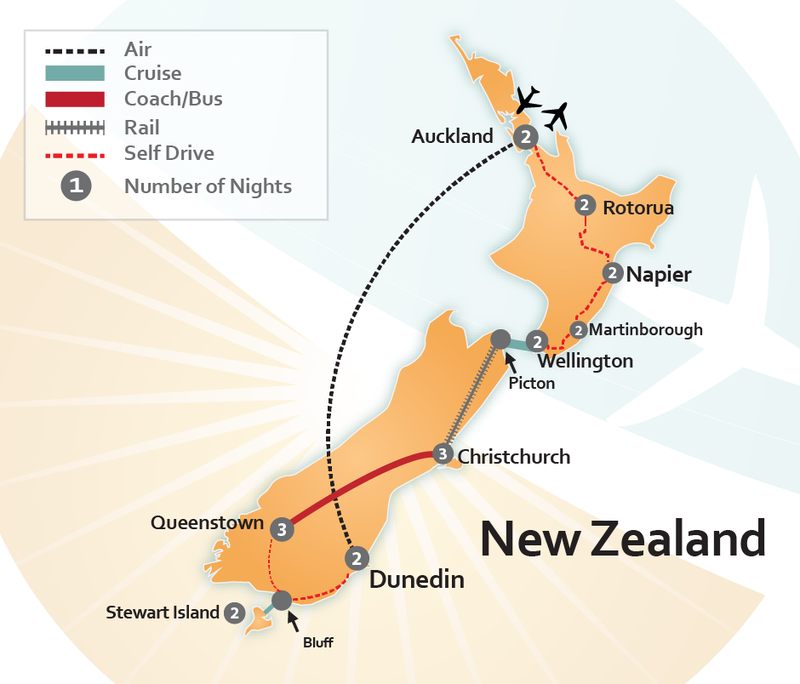 The perfect New Zealand vacation incorporates both the North and South Islands. 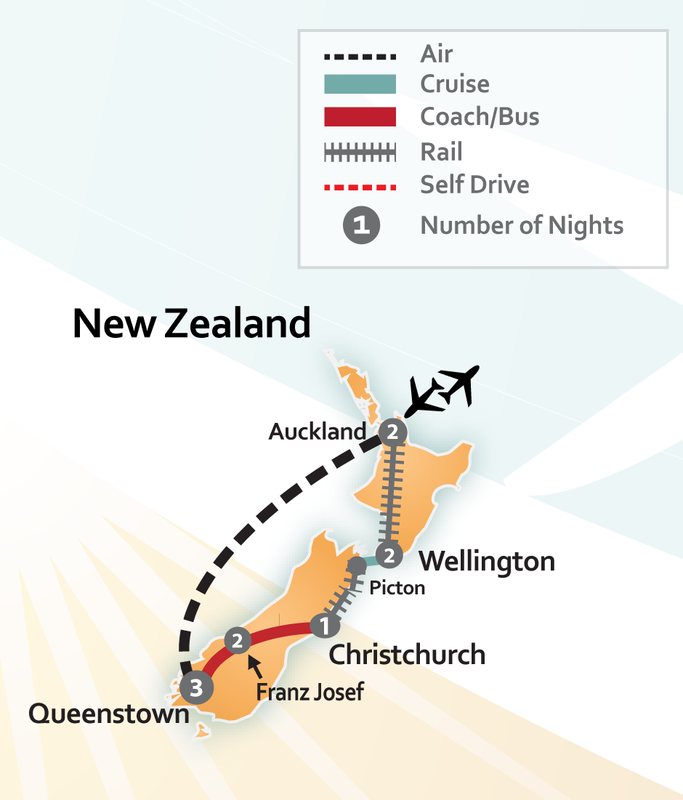 Cross from Wellington in the North Island to Picton in the South Island, where your journey through New Zealand’s entrancing southern beauty awaits. The Picton and Marlborough region is all about its world-famous Sauvignon Blanc and delicious seafood. Here you’ll taste the freshest mussels and experience award-winning wineries set within green valleys and brilliant blue waterways. Soak up the sun in Nelson Tasman, the sunniest region in New Zealand. Relax on its long golden beaches or explore Abel Tasman National Park on amazing hikes, sailing or kayaking. You may even spot dolphins playing in the water! Food and wine lovers will want to put Nelson on the top of the list. With a reputation for Pinot Noir, the country’s designated craft brewing capital and plenty of locally-sourced gourmet food, Nelson is the perfect place to wine and dine on your New Zealand vacation. Experience New Zealand’s great train journeys through rail travel in the South Island. 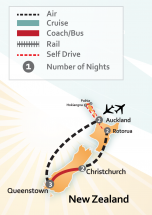 Catch the Coastal Pacific Cross the Southern Alps as you travel from Christchurch to the west coast, passing through the incredible Staircase viaduct, Arthur’s Pass National Park and the Otira Tunnel. Travel further down the west coast for some of the South Island’s most spectacular scenery. See the bright turquoise water of Lake Tekapo framed by the majestic ranges of Aoraki/Mount Cook. The snow-capped mountain tops and purple lupins flowers surrounding the lake create a picture right out of a story book. Here you’ll find one of New Zealand’s best spots for star-gazing. Just a short distance from this picturesque wonderland you’ll find spectacular glaciers. Franz Josef and Fox Glacier are popular destinations for adventure seekers to hike, climb and explore the nooks and crannies of these glaciers. Scenic helicopter flights are perhaps one of the best ways to take in the beauty of this region. When you’re in the South Island, Queenstown is a must. Named the “Adventure Capital of the World,” here you’ll cross off every item from your bucket list. 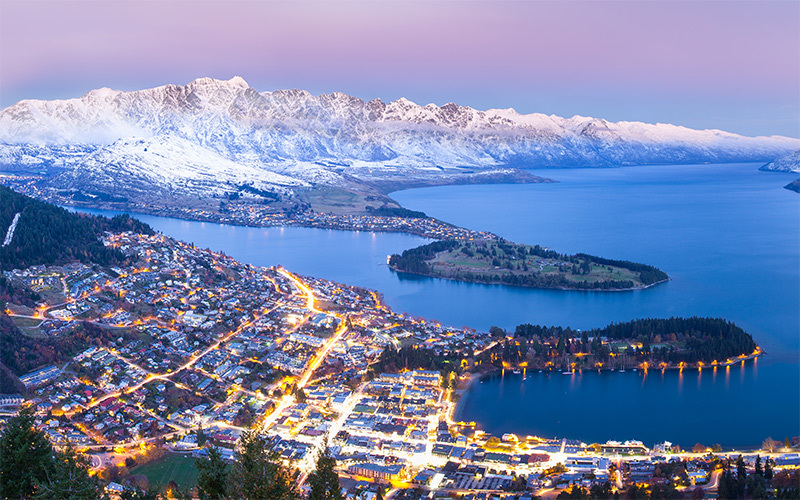 Bungy jumping, sky diving, river rafting, snowboarding – Queenstown has it all. Not one for thrills? Take it slow and soak in the famous Onsen Hot Pools, overlooking the scenic Shotover Canyon. Explore historic towns and railways in the Central Otago region. 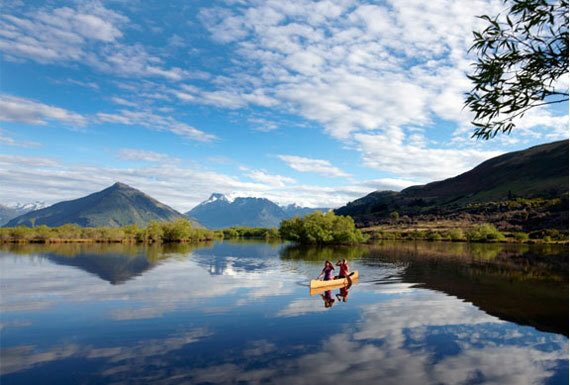 Dotted with wineries, friendly townships, a growing arts culture and well-preserved gold heritage, you’ll find pure Kiwi hospitality set in unparalleled scenery. Discover the Middle-Earth magic in Glenorchy, right on the doorstep of Queenstown, where many scenes from the Lord of the Rings films were shot. With native beech forest set against towering mountain ranges, the charms of this region will take your breath away. After, head to Fiordland for spectacular natural features. Here you’ll discover Milford and Doubtful Sounds. Cruise out on the sounds and take in the quiet majesty of the dark mountains around you, covered in rainforests and cascading waterfalls. 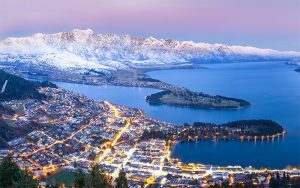 Only a few hours away from some of the country’s most spectacular scenery, Queenstown is the perfect base for South Island adventures on a New Zealand vacation. Apart from the North and South Islands, New Zealand is home to dozens of smaller islands perfect for day trips throughout your trip. Waiheke Island, just a 30-minute ferry ride away from Auckland, is a haven for food and wine lovers. Rangitoto Island, in the Hauraki Gulf also across Auckland, is a volcanic wonderland with cooled lava caves, lava fields and walking trails winding through untouched wilderness, perfect for nature lovers. Take a scenic helicopter flight over White Island, New Zealand’s most active volcano. Visit New Zealand’s first marine reserve at Goat Island, where snorkelers can explore the shallow rock pools and scuba divers can encounter marine life hundreds of years old. 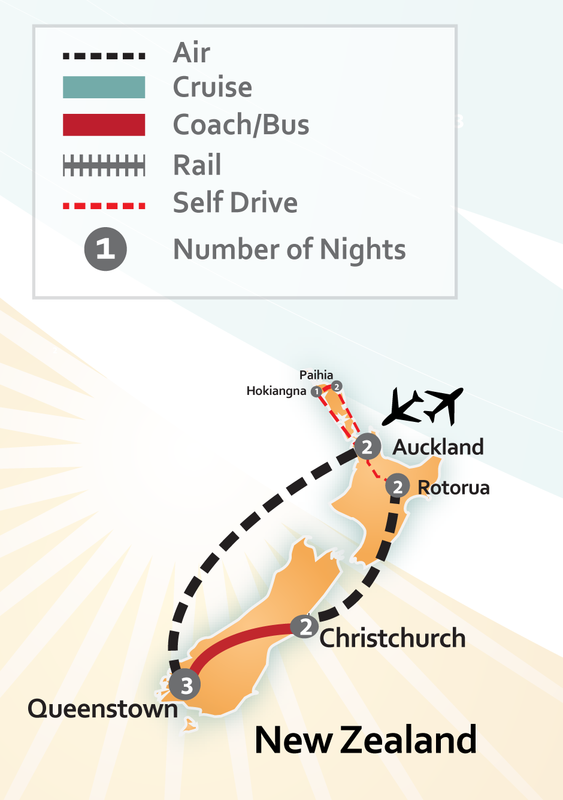 The list of natural attractions, things to see and do while on a New Zealand is virtually endless. There really is nothing quite like New Zealand. It’s a blend of modern, rugged and rich. Modern in technology & lifestyle, rugged in its raw natural beauty, and rich in its culture and heritage. 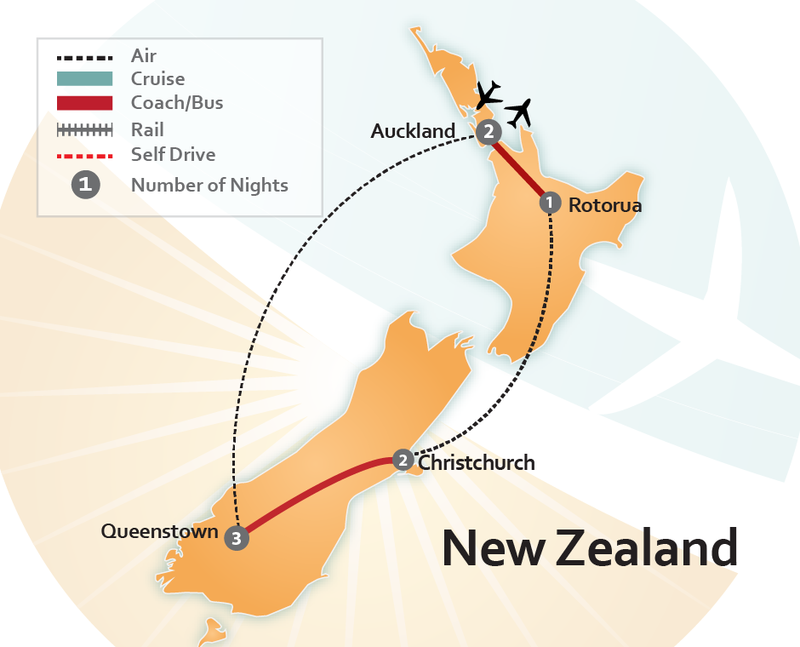 If you’re dreaming of a New Zealand vacation – here’s the first step to going. 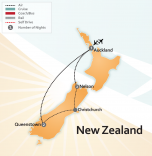 Book your New Zealand vacation today!